The warmest weather in nearly half a year! DENVER — Warm and dry weather will continue across Colorado today, but a new storm will bring a chance for rain and snow Thursday and Friday. Some high clouds will drift over the state, but no precipitation is expected. Low temperatures will drop to the mid 30s to low 40s for Denver and the northeast plains, low 50s over southeastern Colorado and upper 20s to mid-30s in the mountains. 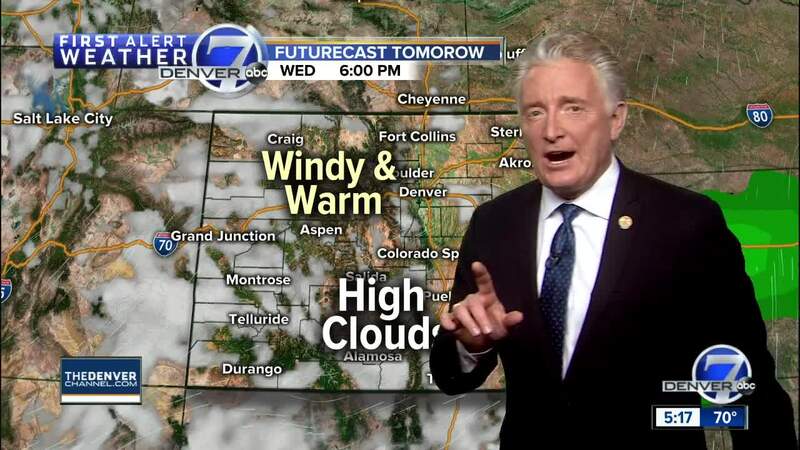 Later today will be windy and warm with highs soaring into the 70s to even low 80s over eastern Colorado! Today will be the warmest day of the week, but the winds will be gusty from the southwest at 15-25 mph. Fire danger will be elevated across southeast Colorado. Our next significant system looks like it will arrive Thursday afternoon through Friday, dropping our temperatures and re-introducing the chance for widespread rain and snow. Clouds will increase on Thursday with some rain and snow developing late in the day. Highs will still be mild - in the 60s for Denver and 40s to low 50s in the mountains. Friday will turn colder with rain for Denver and the eastern plains. Rain will turn to snow late Friday into early Saturday. Temperatures will also take a pretty big dip, with 50s from Friday and 30s to low 40s on Saturday. Skies will clear Saturday afternoon. Another storm system will bring a chance for snow to the mountains and showers for Denver and the eastern plains on Sunday.